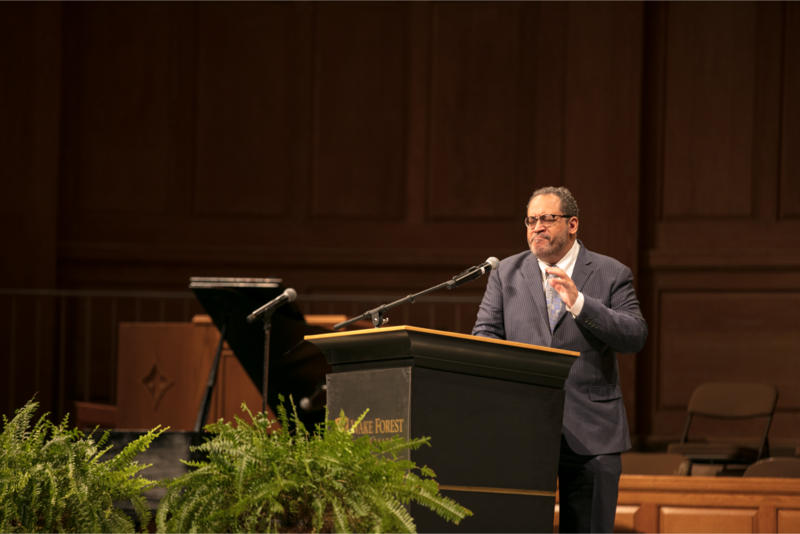 Georgetown sociology professor and author Michael Eric Dyson’s voice reverberated through Wait Chapel on Jan. 22 during the 18th annual Dr. Martin Luther King Jr. Celebration co-sponsored by Wake Forest University and Winston-Salem State University (WSSU.) The event brought nearly 2,000 local faculty, students and families to hear keynote speaker Dyson discuss the powerful moments of Dr. Martin Luther King’s legacy and the polarizing issues of race still embedded in America today. President Hatch took the stage after WSSU student Taylor Walker and Wake Forest student Janeil Savage opened the event. Hatch and WSSU Chancellor Elwood Robinson lamented the recent death of Najee Ali Baker, a WSSU student who was shot and killed on the Wake Forest campus and advocated for a community that cherishes and comforts one another in a time of mourning. “Do not be sidelined by apathy, but engage each other with open and honest conversation,” Hatch said during his welcome address. Hatch captured the true reason why Wake Forest and WSSU keep the Martin Luther King Jr. Celebration tradition alive: to foster and maintain our strong community and camaraderie and to preserve the American creed of equality. Dyson has scrupulously followed the life and legacy of Dr. Martin Luther King Jr., publishing two books on MLK and authoring many more on the enduring problems of humanity as well as race and the current presidency. Dyson celebrated the genius of King and his poignant words of influence which captivated the world but also touched on many profound points of his own. Dyson reflected on Americanism and the ideological construction of whiteness as a powerful and paralyzing misconception. While Dyson refrained from mentioning Donald Trump, the audience responded well to his rhetoric aimed at the president. The title of Dyson’s speech was “A Man Who Made America Great,” in reference to King, but also served as another jab at President Trump’s campaign slogan. Kendal McBroom, a Duke alumnus who is currently a Divinity school student, spoke about the relevance of Dyson’s speech in a divisive time.